Canada Wins GOLD in France!! 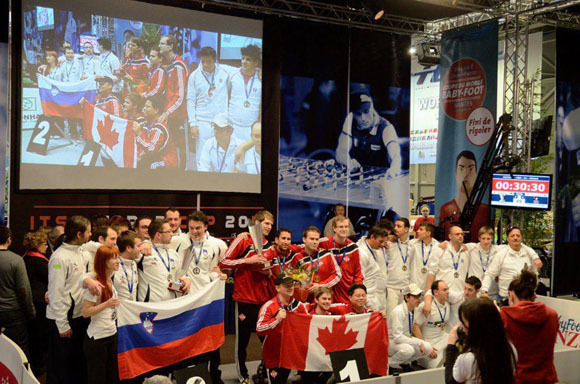 On January 8th, in an epic 3 hour final match against Slovenia, Canada emerged victorious and captured the Gold medal in the Division II Mens event at the International Table Soccer Federation's World Cup event in Nantes, France. The World Cup ran from January 5th to 8th. 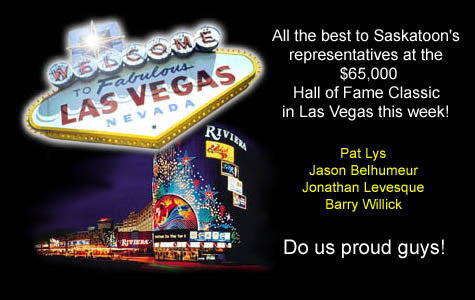 Saskatoon's own Barry Willick was one of the seven member team representing Canada! We've made a comeback! Apparently, there are a lot of foosers in Saskatoon that are interested in pumping new life into the once vibrant local foosball scene. We started by planning to meet every Thursday at the Snooker Shack for a DYP (Draw Your Partner) tournament of sorts and we've already added a second event (Singles) on Tuesday evenings. Our goal is to make it fun for players of all skill levels to compete and hone their skills. Even if you have never played before and want to give foosball a try, feel free to drop in. 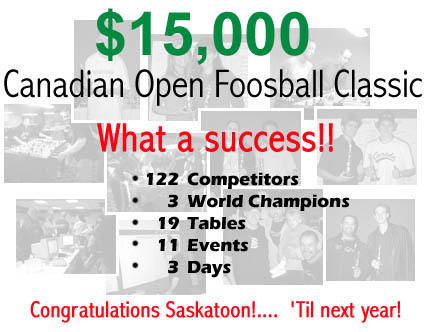 A few years ago, the Saskatoon Foosball Club was one of the largest and most active foosball clubs in Canada with 3 local events per week. 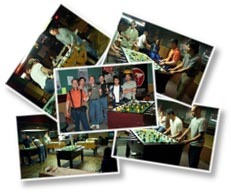 The SFC also hosted the Canadian Open Foosball Classic on an annual basis that attracted players from accross Canada and the United States. Who knows... maybe we can do it again! The Saskatoon Foosball Club will be hosting a FREE Foosball Clinic for youth aged 18 and under on Saturday November 23rd. The Clinic will consist of a period of instruction on rules, strategies, and skills, followed by an opportunity for the youth to play in a non-competitive setting with SFC members on hand to coach. 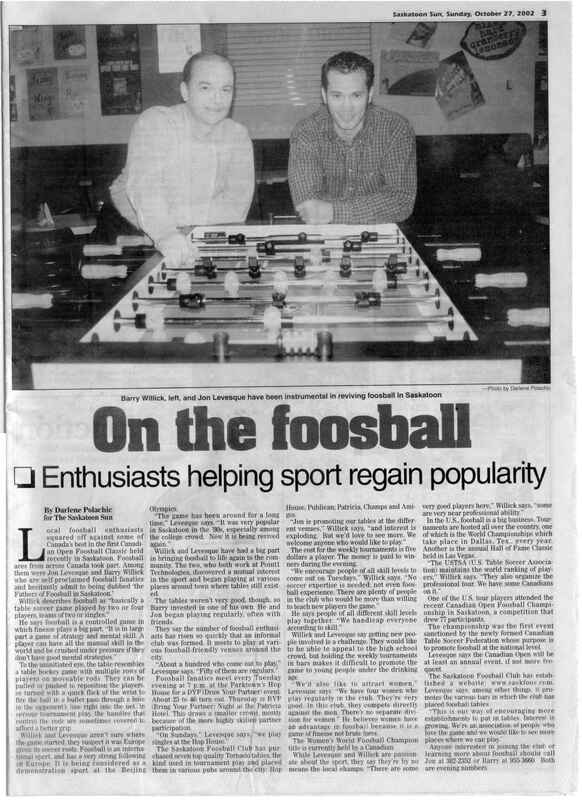 The Oct. 27th edition of the Saskatoon Sun (Page 3) featured a full page article publicizing the Saskatoon Foosball scene. 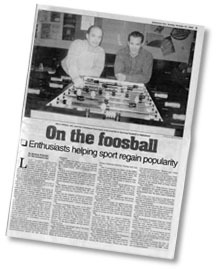 The article featured our own Barry Willick and Jonathan Levesque, their efforts to promote Foosball, and a discussion of the game and the scene here in Saskatoon. Emphasized in the article is the desire to increase participation by encouraging new players to come out and learn the game. - More than $6800 in cash and prizes! If you didn't already know, Calgary hosted an excellent foosball tournament over the long weekend and 7 of us from S'toon attended. If you've never been to a large tournaments like this before, you don't know what your missing. Although the Open events were dominated by the Alberta Pro's. Saskatoon's own Nathan Van Melle and Patrick Lys placed extremely well, both individually and as a team in the Rookie and Semi-Pro events. Way to go guys! For a complete list of results, see the Counterstrike section of www.empireamusements.com. As you can see, we've undergone a minor site overhaul. The purpose of this change is to claim a bit of real estate on the screen for other purposes. We want to display upcoming events and updates on the right of the page. These components will find their way onto the site in the coming days. Please feel free to send in any comments/suggestions that you may have. Thursday evening (23rd) - The Hop House - 7:15pm Sharp! 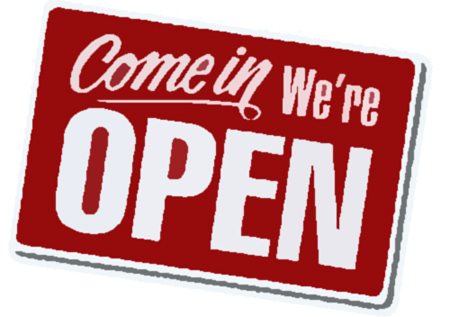 - Everyone welcome! Like to go it alone? This may be the tourney for you. Play on Amigos "Brand New" Tornado table! Sunday Evening (26th) - Amigos - 7:15pm Sharp! - Everyone welcome! Everyone welcome to this "Draw Your Partner" tournament. This is our largest event of the week, usually attracting between 30 - 40 players. Always a ton of fun! Tuesday Night (28th) - The Hop House - 7:15pm Sharp! - Everyone welcome! 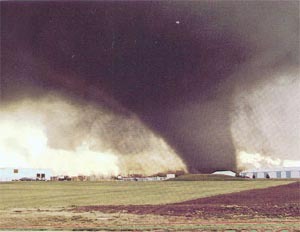 Please be cautious.... Tornado's have been touching down all over Saskatoon in the last couple of weeks! Fortunately for us, they're the Foosball kind! Our Tuesday DYP attracted 40 Foosers to the Hop House! The tournament went without a flaw and we managed to finish before 10:30pm. Thanks to Patrick Lys for taking responsibility for the draw and keeping things running smoothly. Here's a shot of the final game between the team of Brendan King / Dave Boukes (left) and Nathan Van Melle / Tom Hanna. Brendan & Dave went un-defeated on the night to take home the $110 first prize! Check out the new "Messages" link! 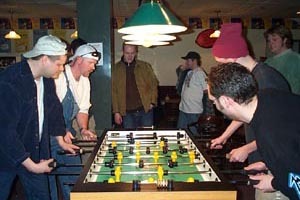 Now we can post messages and carry on discussions about Foosball related topics, even on nights other than Tuesdays! You'll have to register before you can post a message or a reply, but everyone is welcome, so please enjoy. 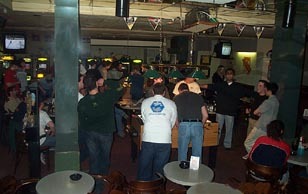 36 Foosers showed up last night to play in our first tournament since our second table was installed! Needless to say, we had a great time. 53 tournament games were played to decide who would take home the first prize of $110. In the end, Terry WilGenhof and Barry Willick came back from the B side to win 3 straight against the A side winners, Grant Erickson and Shaun Sanford, and claim top honours. This was our first night of using our new ranking system. We definately identified a few kinks and anomolies that we will have to work out, but all in all, it went great! 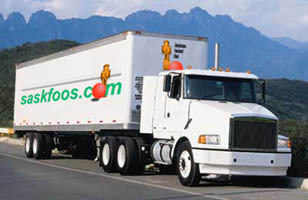 Here is a shot of our truck leaving Vancouver early Monday morning with our new T2000 Table! We're expecting it to arrive by the end of the week and should be up and running well in advance of next Tuesday's DYP meet. Once we have it in place we should be able to speed up our tourneys and give everyone a chance to play more foosball! We're also looking to add some variety at different times such as Singles, Goalie Wars, Forward Shootouts, and higher stakes BYP events. Once again we've drawn our best turnout ever with 28 players! Congratulations to Tom Hannah and Jim Swaby who walked away with the first prize of $100! As usual, a good time was had by all but we've come to realize that WE NEED ANOTHER TABLE!